Iyiola Oyedepo, PDP members vacate party for Saraki, Ahmed, defect to APC – Royal Times of Nigeria. The political development in Kwara state is getting more interesting, as members of the Peoples Democratic Party, PDP, in the state led by its Chairman, Akogun Iyiola Oyedepo, have announced plans to defect to the All Progressive Congress, APC. Oyedepo disclosed their defection to the APC today while featuring on RoyalFM’s News and Current Affairs Programme, Oro Sunnukun via phone call. 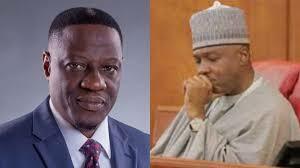 The legal practitioner who fought earnestly to win the opposition party’s leadership position, also announced his resignation as Chairman of the PDP in Kwara state. Their exit from the PDP, according to Oyedepo follows the defection of Senate President, Dr Bukola Saraki, Kwara state Governor Abdufatah Ahmed, other political office holders as well as their loyalists from the APC to the PDP. Oyedepo who insisted that he cannot unite politically with Dr Saraki lampooned the PDP National leadership for embracing Saraki and Ahmed for selfish interest and because of their financial might. Oyedepo said they had already met with the APC and had already concluded plans to work together in the party in the interest of Kwara and Nigeria.